Murder Of The Universe is a face-melting musical assault concerned with the downfall of man, the death of the planet....the murder of the whole goddamn universe. Lit by thunderclaps and lightning, Murder Of The Universe inhabits a sonic landscape of death, decay, ossification, fossilisation, rebirth. It is a place occupied by wandering shape-shifting beasts, bleeding skies, pools of blood, great fires and mushroom clouds; a planet rent asunder by conflict. It may take years for its true importance to be appreciated. There are simply no capital letters large enough to convey the EPIC nature of this collection. Their tenth album in five dizzying years, the first eight tracks of Murder Of The Universe alone sees songs doing battle with one another (‘Altered Beast’ Pts I to IV and ‘Alter Me’ Pts I to III), as man, beast and automaton collide in a death grapple. Flesh and bone meets mud and metal as the listener is treated to funereal fugue pieces (‘Some Context’), primordial drone-sludge (‘The Reticent Raconteur’), demonic doom-chants (‘The Floating Fire’), cyborg-narrated kosmiche workouts (‘Han-Tyumi, The Confused Cyborg’) and technicolour Outback proto-metal (‘Vomit Coffin’). Snippets of their breakthrough records I’m In Your Mind Fuzz and Nonagon Infinity resurface throughout in ghostly shadow form to haunt their latest sound. In years to come King Gizzard & The Lizard Wizard will be judged not by their separate albums, but by a body of work where themes, melodies, motifs, riffs and ideas resurface and recur, each album peeling back a layer of the onion to glimpse at past and future alike. 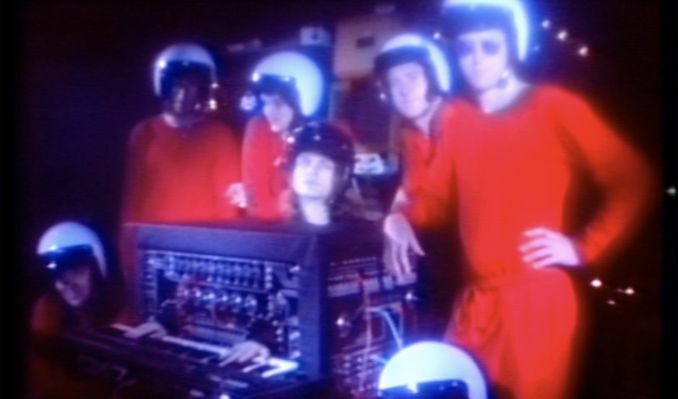 Formed in 2010 in Geelong, fifty miles outside of Melbourne (where they now reside) as a jam band off-shoot of a variety of other projects, King Gizzard & the Lizard Wizard released their debut album 12 Bar Bruise in 2012. Currently the most productive band on the planet, they are a once-in-generation group who play a heady combination of psychedelia, prog rock, freakbeat, jazz, heavy metal and Krautrock at a breathless punk pace; theirs is a high-velocity sound, each album a transportative diversion down a slippery worm-hole steered by seven minds sharing one on-going journey. Those who have seen them live will attest that King Gizzard & The Lizard Wizard can go toe-to-toe with any of those forefathers that keen ears might hear shades of embedded deep within Murder Of The Universe: Aphrodite’s Child, Mahivishnu Orchestra, Hawkwind, King Crimson, The Doors, 13th Elevators, Black Sabbath, Led Zeppelin, Amon Duul II. Whether recording albums that connect into an infinite loop of sound (2016’s Nonagon Infinity), jazz-leaning pieces of the exact same length (2015’s Quarters! ), surprising all-comers with a bucolic collection of sun-drenched pastoral folk-pop comedown music (2015’s Paper Mache Dream Balloon) King Gizzard & The Lizard Wizard do not do things by halves. Their creative pudding is over-egged and all the better for it. Murder Of The Universe follows hot on the scorched black heels of Flying Microtonal Banana (March 2017), which saw the band customise their own instruments in order to explores those spaces between existing tones – microtones. Charting at No. 2 in Australia it is one of the most far-out collections to trouble the lower regions of the album charts in the US and UK too. Album discography: 12 Bar Bruise (2012), Eyes Like the Sky (2013), Float Along – Fill Your Lungs (2013), Oddments (2014), I'm In Your Mind Fuzz (2014), Quarters! (2015), Paper Mache Dream Balloon (2015), Nonagon Infinity (2016), Flying Microtonal Banana (2017), Murder of the Universe (2017).